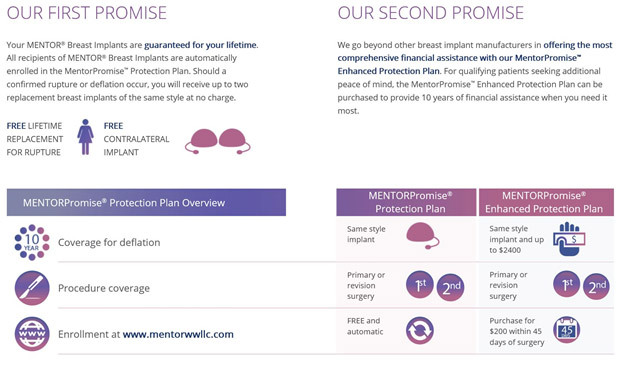 Dr. Jacobsen uses breast implants from The Mentor Corporation, which has extensive warranty coverage that will ensure the longevity of your implants. Request a consultation today to learn more about what's covered. The Mentor Corporation patient does have some limited warrantees regarding saline and silicone gel breast implants. They basically promise that your implants are guaranteed for your life time. They will replace the implant for rupture during your lifetime and at some point, will under some circumstances, also replace the other side to make sure that you are even. They offer a very comprehensive financial assistance program as well cover some of the other associated expenses regarding additional surgery in the future if you should need this. There is also a Mentor program for insurance that you can buy as well. Here are some of the basic elements of the warranty that you can take advantage of or to purchase to have more financial security in the future. Dr. J is an amazing surgeon . he also has an exceptional staff. I am very thankful for this whole staff. I'm having a hard time with this because, I can't say enough good things about this office! Dr. Jacobsen is an amazing surgeon. He is always available, for any questions or concern. His staff go way beyond any other office I have seen. They are more than helpful with insurance, appointments, or any issue or questions. The office is both beautiful, and comfy. Like I said can't say enough. Very upper class. Beautiful surroundings, beautiful people. Very tranquil. Highly recommend. Dr. Jacobsen and his team are beyond exeptional! From the moment you walk in you are treated with care and professionalism. Very very impressed! Thank you Absolutely recommend!!! Dr. Jacobsen and his entire office staff was a great experience for me. I was referred to his office after my MOHS procedure that left my face in worse shape than I had hoped for. It was a drive across town for me and it was well worth it. I was concerned about the state of the open wound on my face and desired the best outcome possible, I was worried. From the moment I stepped into his office I felt at ease. Several things impressed me with Dr. Jacobsen and his office staff. First and foremost was the ease of communication both directly in office and submitting documents and photos via his website and/or email. The ability to reach out to and get a response from the doctor 24/7 is so nice. Each person I spoke to was helpful and was mindful and sensitive to my needs. Dr. Jacobsen was great, he was very personable, very easy to talk to you, he answered all my questions, and was confident in his skill. I truly felt it was a blessing to be referred to and treated by Dr. Jacobsen. Lastly, Dr. Jacobsen's office is beautifully designed and decorated and includes WIFI, these little things all help with setting the right environment. I left Dr. Jacobsen office in far better shape than when I arrived. His many years of experience is evident in his work.